There is an ongoing debate in the VW/Audi community as to whether or not the S3 is worth the premium over the similarly powered, and more practical Golf R. Our friend Matt Farah, thinks the four-rings are worth the extra coin, but would you pay over $16,000 to get special paint and a fancy interior? According to Fortitude, Audi is offering a limited edition run of 25 S3 Exclusive models that will be evenly split into the following colors: Glut Orange, Viper Green, Vegas Yellow, Misano Red and Sepang Blue. These limited edition cars will be built on the Prestige package and will have upgrades such as contrast stitching, full leather interior, and a few other interior bits from Audi’s “Exclusive” program. There are no performance upgrades, though the cars will come standard with the 19” Performance Package that is already available on the S3. Now here where things get a little crazy....the price for the “Exclusive” Seapang Blue and Misano Red cars is $57,250 which is about $16,000 over the base MSRP of $41,100, (Update: these are based on a Prestige package car, which would really cost around $50,000), which . If you must have the fastest Skittle on the road the Glut Orange, Viper Green, Vegas Yellow cars will carry a price of $59,900, a difference of $18,800. 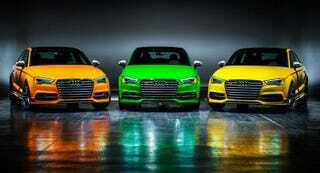 Only five cars will be made in each color. What makes the S3 appealing is that is a very quick little sedan that can blend in with the crowd, so I would imagine that most buyers would not want to pay extra for the unwanted attention. However, I’m sure there are at least 25 hard-core Audi fans that would be willing pony up the cash in order to have a unique S3.